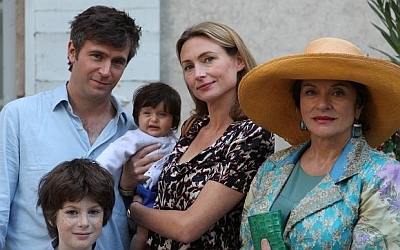 With lines as awkward as “Your milk was so laced with gin I could barely drink it”, the tone is quickly set for Mother’s Milk (2012), Gerry Fox’s adaptation of Edward St. Aubyn’s novel, a dynastic drama spiked with an overabundance of Freudian froth. The Melroses, once a distinguished, wealthy family, are hitting hard times. With the money drying up, Patrick (Jack Davenport) finds himself trapped in a turbulent marriage with wife Mary (Annabel Mullion), who is ever anxious that she will repeat the sins of her own mother, Kettle (Diana Quick). News comes through that Patrick’s mother, who is in her final days as an Alzheimer’s sufferer, has donated their second home in Provence to a New Age hippie-type. Patrick’s relationship with his children is less than healthy, and he responds to life’s problems by embarking on an affair with his wife’s sister whilst hitting the bottle – hard. Fox’s upper-middle-class drama certainly has plenty of juicy material with which to entice audiences, especially those who enjoy rummaging around the drawers of family history. With more psychological issues than the collected works of Freud himself, Mother’s Milk explores how the absence of parental love affects children – even if they did get a pony for their 10th birthday. Sadly, Aubyn’s prose hasn’t quite been translated with the same wit and menace for the screen, but for the most part these themes are well developed by Fox. Charting three generations, the plot outlines how each set of parents inevitably screws up their children, all set against the beautiful backdrop of Southern France. Disappointingly, this acerbic tale is so jammed packed with unlikeable characters (who kindle almost no sympathy) that audiences will find it difficult to care about the woes of these over-privileged toffs. The attempts at comedy, in the form of Patrick’s murderous or lewd daydreams, take a swing at lightening the tone but often fail to hit the mark. Thankfully, performances are strong throughout. Davenport was made for the role as a bitter drunk swanning around the Med, bottle in hand, swearing at almost everyone he encounters. Equally, Margaret Tyzack’s performance convinces us of her suffering with poise and precision. Mullion’s Mary provides some point of sympathy as she emerges as a more likeable character by the second and third act. Whilst trapped in both her own and familial problems, she is self-aware enough to challenge the status quo. Although the material is ripe, Fox’s Mother’s Milk is too poisonous in its delivery, lacking a true sense of light relief and is further hindered by the unsatisfying resolution at the conclusion of the drama. This definitely isn’t one to watch with the family in the run up to Christmas – unless you can’t stand your family, of course.